Formed in 2005, Orme Holler has combined the very best in vocal Harmony along with driving musicianship to create one of the best live shows In bluegrass music today. Based here in Charleston, they have become very popular on the resort and festival circuit and have performed for US Senators and in 2006, The Vice President. 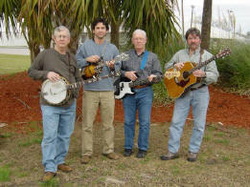 The Orme Holler Bluegrass Band has performed at Bluegrass Festivals in Virginia, North and South Carolina, Georgia and Tennessee. At The National Corn Bread Festival for Martha White Flour, they were both opening act and back-up Band for Grand Old Opry star Bill Anderson.